Gender roles in agriculture: Did anything change? 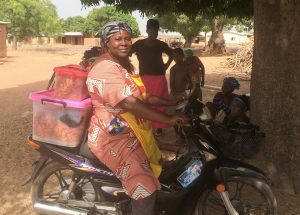 In March 2017, IFPRI’s Development Strategy and Governance Division (DSGD) published a discussion paper about changing gender roles in agriculture, based on an analysis of 20 years of data from Ghana. In this blog, Monica Schuster, a post-doctoral research fellow at the Institute of Development Policy of the University of Antwerp, Belgium, and Isabel Lambrecht, a research fellow in IFPRI’s DSGD, highlight some of their findings. Concerns about gender inequality have been voiced since the 1980s, yet still today, these same concerns are expressed with respect to gender differences, women’s access to and control over resources, and women’s empowerment. Has nothing really changed? By now, major efforts are made to revisit stylized ‘facts’ about gender, commonly referred to as “gender myths.” Many of these widely circulated myths do not seem to hold true, or are largely inaccurate. Since gender roles are dynamic and may respond to changing socio-economic circumstances, were some of these commonly voiced myths perhaps true many years ago, and simply maintained over time? We try to answer these questions by assessing to what extent gender differences in agriculture in Ghana exist, and how they changed between 1991 and 2013. We find considerable nuances in gender patterns: stylized facts do not always hold; some of these ‘facts’ change over time; and there is significant variation in the extent of and changes in gender discrepancies across themes, different agroecological zones, ethnicities, household types, and women’s roles in the household. Myth: Women have limited access to land and lose out when land becomes more commercialized. Reality: While the gender gap in landholding in Ghana has diminished over time, a new gender gap in the size of land held has widened. Women in matrilineal ethnic groups are more likely to hold land, but hold plots of smaller size than women in patrilineal ethnic groups. This confirms worries in the literature about women’s access to land, but it also shows that women’s access to land is not as low as advocacy groups tend to indicate. Myth: Crops can be classified as men’s crops or women’s crops, whereby the former are usually cash and the latter subsistence crops. Reality: Gendered cropping patterns are not strong in Ghana. No crops are grown exclusively by men or by women. Yet men are disproportionately involved in the harvesting of some types of crops and grow a larger number of crops. Most crops are more frequently grown by men, compared to women, and are grown more frequently on the land of male plot holders, compared to the land of female plot holders. Between 1991 and 2013, the number of crops grown disproportionately more by men decreased, while the total number of crops grown by male plot holders declined faster than the number grown by women. This leads us to conclude that gendered cropping differences are decreasing over time. Myth: Participation in market activities by female farmers is low. Reality: The data don’t provide evidence that men are mainly drawn to crops that can be commercialized, leaving women with crops for home consumption. When controlling for community, household, and plot characteristics, women are as likely as men to sell crops. Conditional on selling, we find evidence of an equal if not higher market orientation of women compared to men. The often-cited dichotomy between “men’s cash crops” and “women subsistence crops” has likely been overcome in Ghana or never existed to begin with. Myth: Men have more access to modern agricultural inputs compared to women. Reality: We find significant differences in male- and female-headed households’ likelihood of applying inputs, but not in the amounts used per acre. Once an initial hurdle in accessing inputs is overcome, input usage rates are similar. The average likelihood of buying fertilizers and pesticides, and renting animals or equipment increased between 1991 and 2013. In turn, it decreased for seed, labor, and hand tools, indicating a higher mechanization of agriculture but a lack of successful dispersion of new varieties and certified planting material in the past 20 years. The largest gender differences were detected in the larger amounts that female-headed households spent on hiring labor and renting equipment. Myth: Rural women’s occupations are limited to unpaid on-farm labor and household work, while men engage in paid on- and off-farm activities. Reality: The share of adults in rural areas who depend primarily on agriculture for their livelihoods is decreasing. Women still provide more unpaid farm labor than men, but the share of women who do so as their primary employment is decreasing. Women’s participation in agricultural and non-agricultural self-employment, as well as paid employment, rose over time. These changes could indicate increased economic empowerment of women. Considerable differences exist across agroecological zones, ethnic groups, and household types. Gender gaps are often larger in the forest and savannah zones. Being a woman of a matrilineal ethnic group attenuated gender differences for access to land and choice of occupation, but not for the other outcome indicators, and even deepened gender inequalities in the size of land held. This is in line with earlier statements on the limited impact of matrilineality on attenuating gender differences. Our results show that gender patterns in agriculture are different according to a woman’s position within the household. Except for crop commercialization, agricultural cropping patterns of women who are household heads are more similar to male cropping patterns than to those of women who have another position in the household, such as spouses or daughters. Female household heads often face the burden of being both the main provider of cash or in-kind income for the household and the main caretaker of the household. Our results support the hypothesis that a person’s role in the household may be a more important determinant of gender-related patterns observed than the gender of the farmer per se. The evidence we provide calls for more nuanced statements on gender trends in agriculture, as well as efforts to collect more and updated gender-disaggregated data. Many questions remain: What has happened in other countries? What about other aspects and indicators on women in agriculture? How good (or bad) are these changes over time? What has triggered these changes? There are plenty of opportunities for future research on gender roles in agriculture. Lambrecht I, Schuster M, Asare S, Pelleriaux L. 2017. Changing gender roles in agriculture? : Evidence from 20 years of data in Ghana. IFPRI Discussion Paper 01623. Washington, DC: International Food Policy Research Institute, Development Strategy and Governance Division.